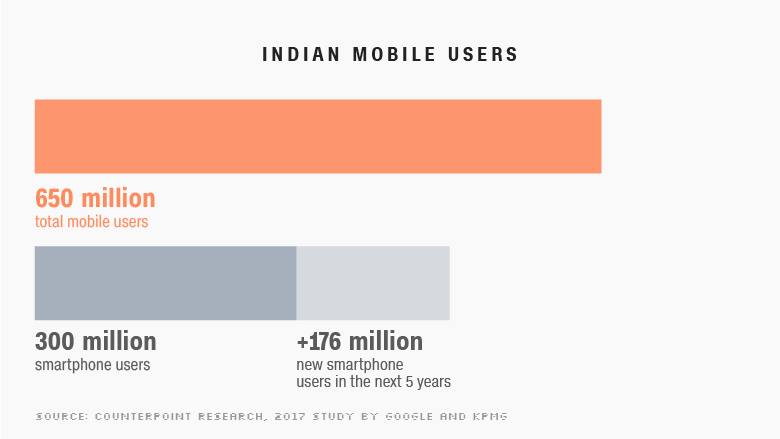 India has nearly as many smartphone users as the U.S. has people, and it's about to get many millions more. The South Asian nation is already one of the world's hottest mobile markets, with everyone from Samsung (SSNLF) and Apple (AAPL) to China's Oppo, Vivo and Xiaomi fighting with Indian brands such as Micromax for a piece of the action. And it's just getting started. Experts say India's tally of 300 million smartphone users could grow by more than 50% in the next few years. There are about 650 million mobile phone users in India, and just over 300 million of them have a smartphone, according to technology consultancy Counterpoint Research. That means India is already a bigger smartphone market than the U.S. and second only to China. It also means there are about 1 billion Indians who do not yet have a smartphone -- a huge market opportunity. "India is in a very sweet spot in terms of smartphone growth," said Shobhit Srivastava, an analyst at Counterpoint Research. "You have over 300 million people sitting on a 2G device that will eventually move forward to a smartphone... this is the potential that India holds." Two out of three Indian mobile users -- or roughly 433 million people -- are planning to upgrade their phones in the next year, according to a recent Counterpoint survey. More than 66% of India's 1.3 billion people still don't have access to the internet. The hundreds of millions set to come online over the next decade will likely do so through mobile devices. "Mobile has already become the the primary device from which users access the internet," said Srivastava. 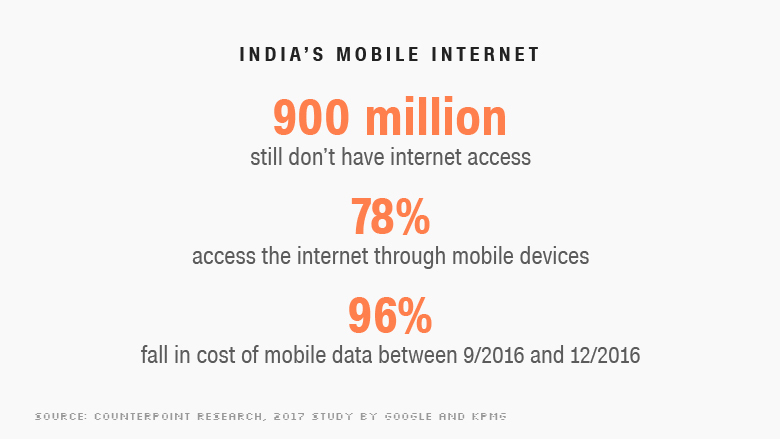 Until recently, connecting via mobile had been prohibitively expensive for most Indians but that is beginning to change thanks to a collapse in the price of data. India's wealthiest man, Mukesh Ambani, sparked a price war a year ago by offering new users six months free access to his Reliance Jio 4G network. The result: India now has some of the cheapest mobile data in the world. High-speed data plans are available for as little as 149 rupees ($2.30) a month. India has dozens of regional languages, and many of the country's newest mobile users are discovering the internet in one of them. 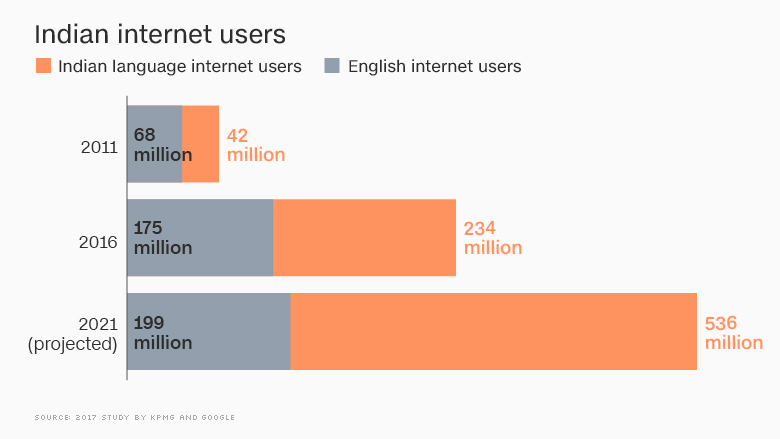 India already has 234 million local language internet users, according to a recent report by Google (GOOGL) and KPMG. That number is expected to soar to 536 million by 2021. "One of the major reasons the smartphone hasn't been able to penetrate rural or [smaller] cities is because it's all in English," said Srivastava. "You need to have the regional languages, and a lot of players have understood that." Indian companies such as Indus OS are creating operating systems in multiple Indian languages. 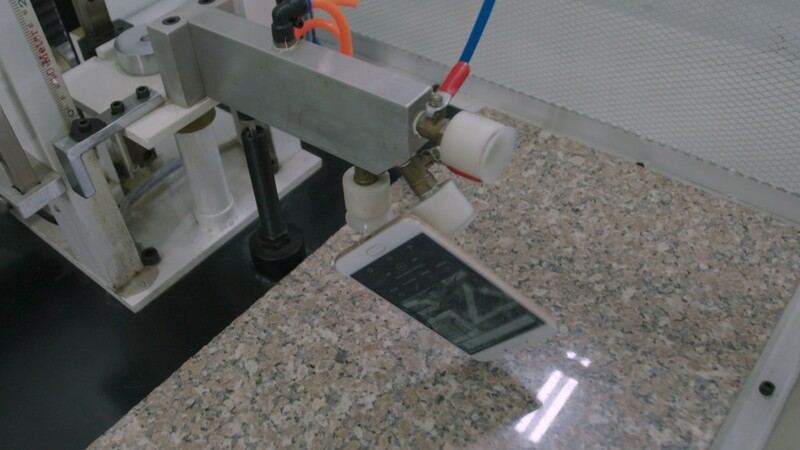 The Indus system is already being used by top homegrown brands such as Micromax. "They are investing in putting regional languages in their smartphones, turning this challenge into a differentiating factor for themselves," he added. India has more than 100 smartphone brands catering to a variety of budgets. Samsung dominates with nearly 25% of the market, according to research firm IDC, but several domestic and international firms have managed to secure smaller but significant shares. IPhones are too expensive for most Indians (the average annual wage is around $1,900) but Apple recently started making select models in the country's tech hub Bangalore in the hope of offering a more competitive product. Chinese manufacturers account for over half the Indian market, having made big inroads over the past year. Srivastava says India is more open to new entrants than China or the U.S., where Apple and Samsung already account for over 70% of the smartphone market, according to comScore. "The barrier to entry is a lot less," Srivastava said. "In India the smaller players do have a chance to grow."